I love fizzy drinks, even if it’s just sparkling water. I think it’s so nice, how when you order a coffee in Europe, they’ll always (okay, not always, but usually) serve it alongside some sparkling water. Sparkling water has the added punch of fizzy little bubbles and bubbles are just so cheerful. Even better than sparkling water though, is sparkling water with flavoured homemade syrup. 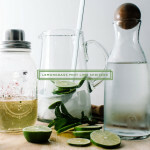 One of my favourites is a super herbal and refreshing mint-lemongrass simple syrup. Essentially, simple syrup is a one-to-one ratio of two things: sugar and water. 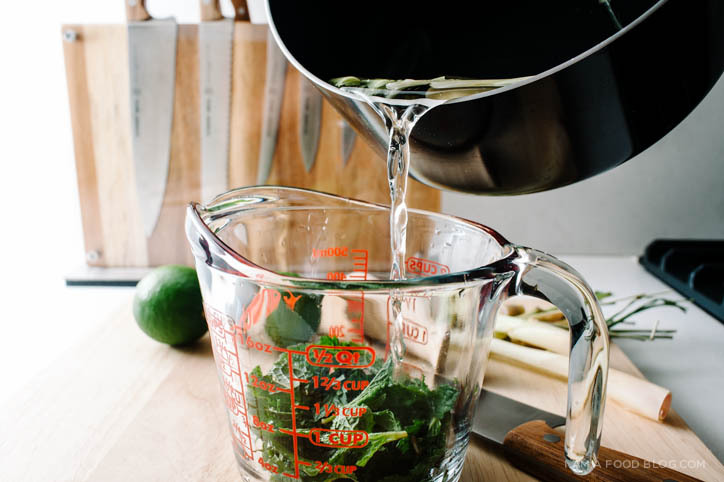 It’s simple in both preparation and ingredient list – simply stir sugar into hot water until the sugar is dissolved. It’s mainly used in cocktails or iced coffee, where it’s handy to already have the sugar dissolved. To flavour simple syrups, you can go two ways: you can infuse flavour while heating the syrup, or you can steep while the syrup is cooling down. I did a one-two punch with this lemongrass mint syrup. The lemongrass (which holds up extremely well to heat) was added to the pot while the sugar and water were brought to a boil and then the mint (which is quite delicate) was added in after the syrup was taken off the heat. The result? A slightly spicy, herbaceous, refreshing syrup. You can add it to iced tea, sparkling water or even plain water if bubbles aren’t your thing. In the words of Martha: it’s a good thing. I collaborated with West Elm on this post: check out the recipe and links to the items I used on their blog, Front & Main. I am seriously in love with the quilted acrylic glasses! i am bubbly, i am refreshing: i am lemongrass mint lime spritzer! Trim the tops and bottoms off of the lemongrass and remove the tough outer leaves until you reach the pale interior. Chop into 2 inch pieces and bruise the pieces using a rolling pin or whatever heavy blunt object you have handy. Add the water, sugar and lemongrass to a small sauce pan. Bring to a boil over medium heat then remove from the heat. Add the mint leaves and let steep for 15 minutes. 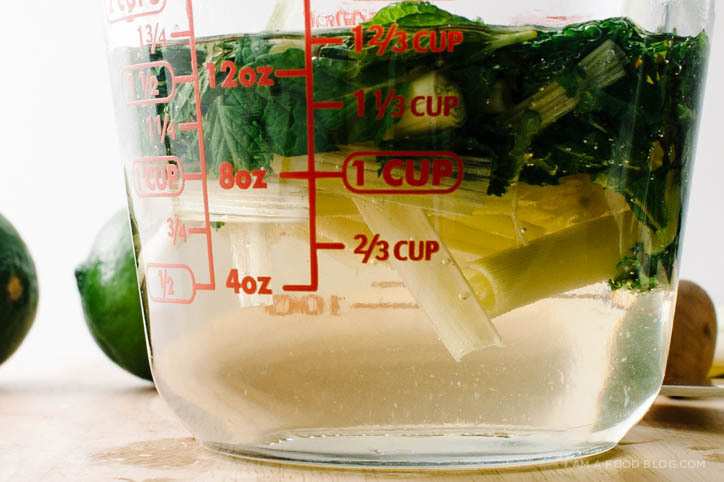 Strain out the mint and lemongrass. Cool and store in a airtight jar until needed. To make the spritzer, place some ice in a glass and add a tablespoon or two of syrup, or to taste. 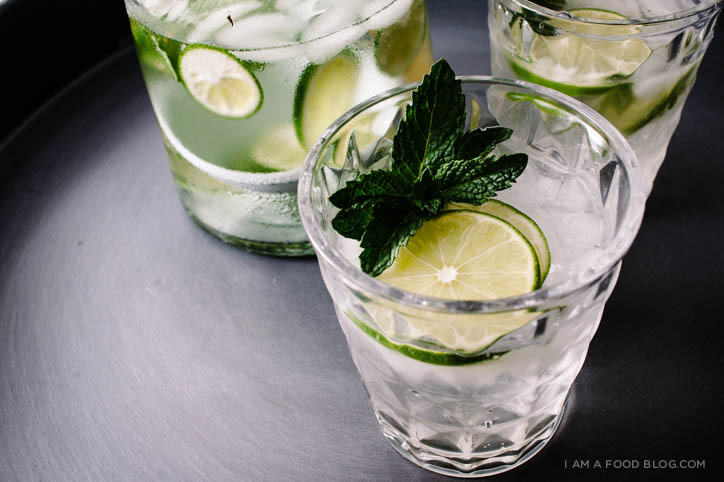 Top with sparkling water, lime slices and mint leaves to garnish. Of course, if you’d like to indulge a bit, feel free to top this off with a splash (or two) of gin and reduce the sparkling water. PS – If you’re still thirsty, you can peruse these drinks, or check out these two awesome blogs: Death to Sour Mix and Bit By a Fox! I love the flavour of this!! Such a neat recipe! thanks katrina! i’ve been trying to use lemongrass more and more. i just love it! I always keep seltzer water on hand during the summer to make fizzy drinks. Lemongrass and mint sounds like a very refreshing combination. I am so with you, I love something other than water sometimes and this looks perfect! I haven’t done much with lemongrass, but this is tempting! Want. Also, that carafe, omg. 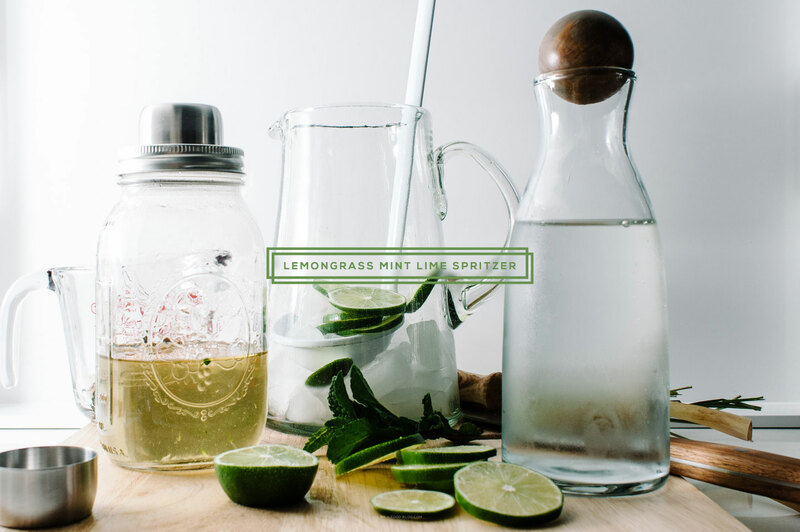 I make so much mint simple syrup every summer for lazy mint juleps, but I love the thought of lemongrass too. I’m thinking gin? Vodka? Anything really. ooh, lazy mint juleps, now THERE’s an idea!! I love when they serve espresso with a little shot glass of sparkling water too! Even better when they serve it with sparkling water and a little curl of lemon peel for the espresso. YUM! I love lemongrass. This sounds like a dream. 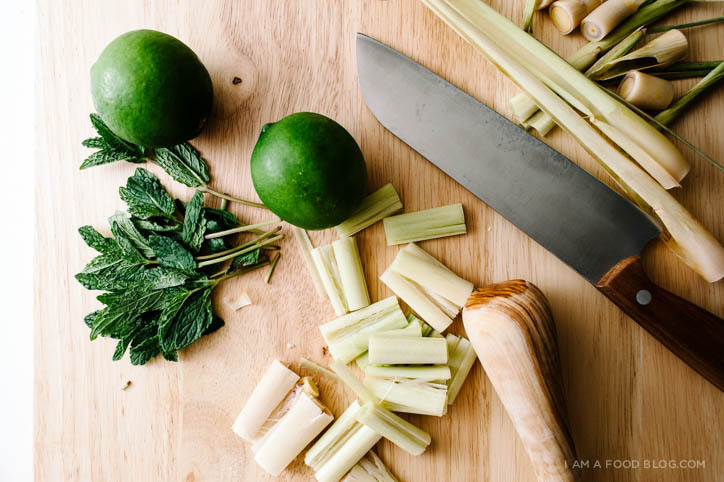 My boyfriend is obsessed with anything lemongrass (and also anything that’s tart) so I need to make this for him–he’d love it (and so would I). Amelia? Not so much. Well this is beautiful and its also going in my belly/liver(with some rum). I’m a recent bubbly-water convert (I don’t know what took me so long. Sorry) and this recipe sounds delicious! I love lemongrass. heehee if you’re not used to drinking bubbly water i think it’s pretty weird…but it’s also delicious! funny though, cause water doesn’t taste like much! I absolutely love lemongrass anything! 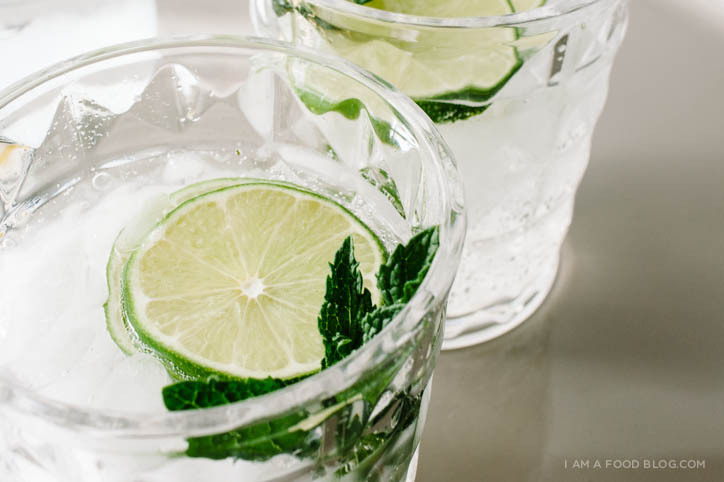 This looks so refreshing–can’t wait to try it! yes, super refreshing! hope you get a chance to try it laura! I’m dreaming of this but with peach syrup…. yum!! Look so great! ooh, peach, mint and lime would be awesome! I’ve been obsessed with adding sparkling water to everything lately. These drinks are totally calling my name!! Beautiful pics, too. So crisp!! thanks tessa!! yes to sparkling errthang! ooh lemongrass chicken with a lemongrass spritzer = heaven! I’m so excited to try this! I just bought a bunch of lemongrass and mint from the Asian grocey store near me. $2 for a huge package of mint and 4 lemongrass stalks, yes please! Plus, you can regrow lemongrass! Ok, I must calm down. Will definitely be making this over the weekend. Thanks for the recipe! I love the glasses too; are they availalbe on Amazon? This sounds amazing! Especially on a warm summer day! sparkling drinks on a warm day = the best way to cool down! This sounds and looks like the perfect summer drink. I am looking forward to trying it out. Ooh, this sounds soo refreshing! I love lemongrass and mint (wonder how a bit of ginger would be, too) and will be trying this on the next grocery run. Thanks!